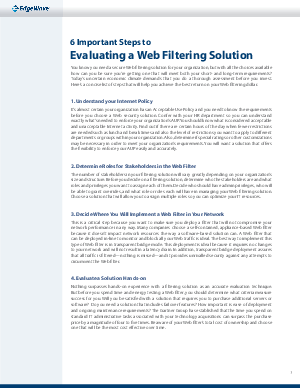 You know you need a secure Web filtering solution for your organization, but with all the choices available how can you be sure you're getting one that will meet both your short- and long-term requirements? Today's uncertain economic climate demands that you do a thorough assessment before you invest. Here's a concise list of steps that will help you achieve the best return on your Web filtering dollar.